Little pooch Max has a very bad day when he tries to oust new playmate Duke from his cosy home in this amusing, if not entirely original, diverting pet story. 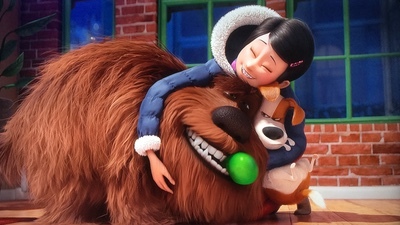 With The Secret Life Of Pets, Universal balances out its other animated feature of the year, the critically acclaimed Kubo And The Two Strings, with a much broader commercial offering, which audiences lapped up to the tune of another billion dollar-grossing cartoon release and provides producer Illumination Entertainment with its second major franchise to compliment its Despicable Me series. 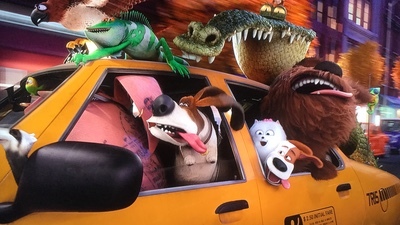 The latest in a long line of animated doggie pictures, Pets forgoes the temptation to view its world from the dogs’ eye level and only show its human characters’ legs, and the real surprise is just how great Illumination’s caricatured human renderings are. 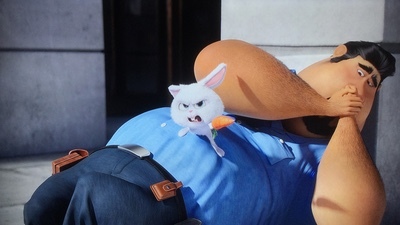 Of course the animals aren’t too shabby either, albeit much more cartoony in design, especially in the supporting characters, although fluffy bunny Snowball may be a tad too typical of a cute animated rabbit, reminding especially of the magical, maniacle carrot chomper in Pixar’s hilarious short Presto to really feel original, even if he’s the funniest homicidal rabbit to come along since Monty Python And The Holy Grail! 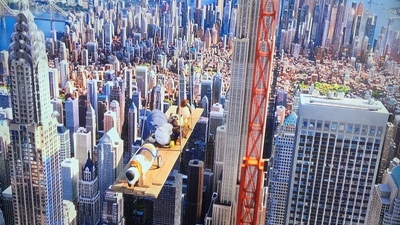 All of them blend into a gorgeously rendered, ideal version of New York that seems to exist purely in that autumnal magic-hour Pixar coloring that just makes everything look golden-hued and warm, and feel more photoreal. The animal behavior is also a highlight, being very well observed and clearly the result of a filmmaking team with more than a few dog owners in their ranks, with some fun if slightly obvious interactions and gags that any pet owner will recognise and be amused by. I’m not too familiar with the work of lead voice Louis CK, who I kept mistaking for Seth Rogen, but he makes for an appealing Max and keeps the character likeable even when he’s being a bit of a jerk to his new roommate Duke (Eric Stonestreet), whom he attempts to get thrown out of their apartment building when he becomes an overbearing presence. 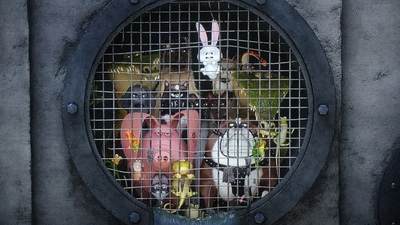 Soon finding themselves on the street and having to team up to get back home, the film just about escapes story comparisons with Toy Story by way of a subplot that finds the unwanted pets of NYC plotting an uprising against its human inhabitants. 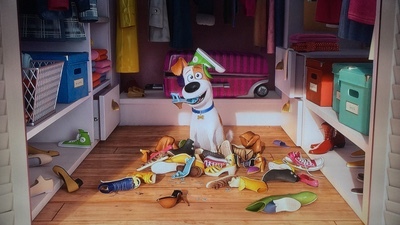 Whereas Pixar might have milked every drop of emotion from this situation, and even the DreamWorks of old may have had something of a poignant angle to the characters’ plight, Illumination is never one to let a laugh go missing and more than anything The Secret Life Of Petsis a cartoon and plays to its comedy strengths consistently and, at a brisk 80 minutes, doesn’t outstay its welcome. Some of the humor is just the now generic mix of hyperactive vocals and smart-aleck comments, some of them obvious and none too inspired (and one, a seemingly prerequisite potty gag, fairly questionable in being suitable for this kind of film at all), so not all the jokes hit, but for every one that does fall a bit flat there’s at least one or two more that should raise a genuine chuckle. 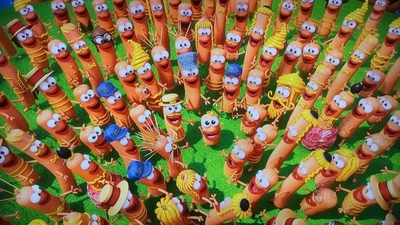 Conversely, and somewhat proving how ideas are starting to become thinner and thinner on the ground thesedays, there’s also a sausage-induced hallucinogenic dream sequence that anticipates the much more adult Sausage Party, released a couple of months later, which is arguably just as funny without having to be as coarse. Animated films naturally take some years to produce, and so similarities between films is often few and far between, but for the second time this year, after Finding Dory, we also get animals driving a truck through traffic, although Dory and Pets both fail to match the sheer pace, lunacy and proficient filmmaking snap of the insanely well done similar sequence in the third Madagascar movie. A truck chase isn’t the only element shared with Dory‘s release, since comic actor Albert Brooks has been a busy guy in cartoonland this year, voicing Dory’s pal Marlin in that film and bird of prey Tiberius here, expressing his constantly torn feelings of needing a friend but wanting to eat them at the same time in an amusing performance that proves to be a highlight. 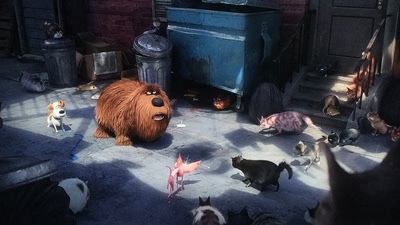 Much of these animal-led CGI comedies begin to blend into each other nowadays, but The Secret Life Of Pets just about has enough to differentiate itself from the pack. It’s interesting that Universal have just acquired the DreamWorks Animation studio because Illumination’s approach most matches DWA’s output in its later years, after the initial burst of creativity with the initial Shrek movies, at least among the major animation studios that aren’t called Disney or Pixar. Of course there’s a certain amount of overlap, but Sony largely goes for the straight cartoon approach, while Blue Sky mixes the security of their Ice Age franchise with more eclectic fare, so far covering everything from Dr Seuss (as has Illumination) to Peanuts, although I’ve yet to really discern what truly sets Illumination apart. The Euro-ccentricities that pepper their films, a byproduct of the artists at their Paris studio, is perhaps a hint, making for an interesting “big budget indie” feel to their films and something of a unique “outsider” viewpoint on American life. 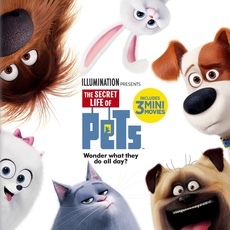 Pets doesn’t really live up to its name by way of its story details, but it’s a fun-enough diversion and a better than average example of the current craze for films in the CG animal comedy genre. I’m surprised that its box-office was as huge as it was, but I guess this maybe says more about the connection people have to their animal companions than suggesting this will be remembered as a new animal classic. 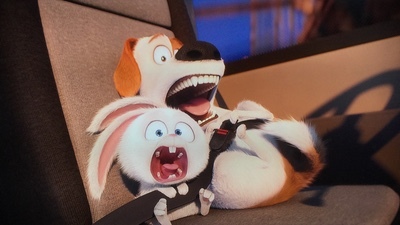 As a new pup owner myself, I certainly enjoyed The Secret Life Of Pets more than I might have done without spotting the behavior touches in the characters, a minor doggie treat in itself. Trailers for Illumination’s Sing, Laika’s Kubo And The Two Strings, G-Kids’ Phantom Boy and the Minions ride at Universal Studios play at the top of the disc, which provides a fluffy bunch of bonus material. Prominently promoted on the front of the box are 3 Mini-Movies, the new name, seemingly, for a short film, and each running around four minutes. Norman TV makes a hero out of one of the main feature’s sidekicks in a zippy cartoon, and Weenie expands on the pre-Sausage Party style sequence from the movie for a totally random, somewhat “wrong”, but still strangely hilarious song that just might be the funniest thing on this disc, while Mower Minions, the short that played with Pets in theaters (with a fun Frozen nod) has the Despicable crew providing questionable gardening services. Rather cool, The Making Of The Mini-Movies sheds light on these three films’ production, running twice as long as any of the shorts and packing in a good deal of info – neat! The Humans That Brought You Pets are profiled briefly in an nine-minute or so collection of Meet The Team soundbites that cover a little bit about their careers and experiences with various pets, although there’s nothing hugely enlightening revealed, and Animals Can Talk: Meet The Actors does pretty much the same for the voice cast, save for no-show Louis CK, spending a near four minutes in what looks to be a set-up recording studio running through their lines. 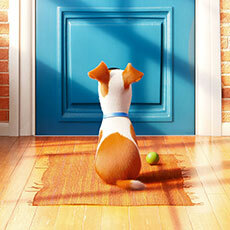 All About The Pets has vocalists Eric Stonestreet and Kevin Hart meeting several of their furry (and no so furry) real-life counterparts for a fun if sometimes awkward six minutes, while Stonestreet returns for Hairstylist To The Dogs, which has him picking up tips on how to groom a pet pooch for almost four minutes. How To Make An Animated Film delves into the making of the movie proper, and although again it’s just a brief piece at a nudge over four minutes, this mix of soundbites and production footage covers the basics, with Anatomy Of A Scene continuing the same line of thought. 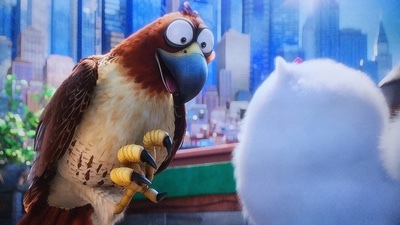 I’m not the hugest Hart fan, and although I’ll admit I enjoyed his character in Pets a lot, I don’t think we really needed The Best Of Snowball recap, an ultimately pointless one-minute clip of his best lines, with a Lovely Day Lyric Video almost as redundant, albeit being nicely put together with characters from the film. 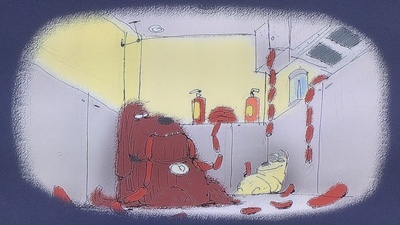 Similarly, a Hot Dog Sing-Along lifts the sausage factory fantasy sequence from the main feature, which should amuse those that don’t remember the same song from Grease all those years ago! 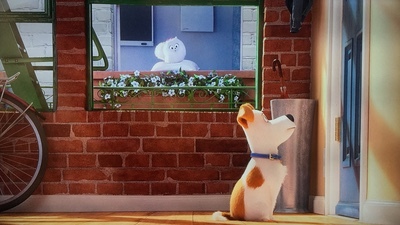 More tenuously, Brian The Minion On Pets is a series of three 50-second Fandango spots, and GoPro: The Secret Life Of Pets is pure and simply product placement at its most blatant and not remotely connected to the movie in any meaningful way. Finally, an extended four-minute Sing Trailer doesn’t reveal much new footage, but does the job of getting us excited for Illumination’s next. 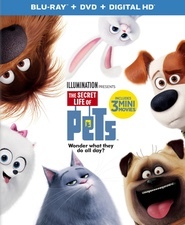 Adapting one of the film’s less visually enticing posters, the Pets sleeve still does the job of being bright and eye-catching, with a slipcover providing the necessary “major release” feel. Computer animated features are about as clean and crisp an image that Blu-ray can deliver, and this is as picture perfect as they come. The short runtime of the feature means the disc gives the film plenty of room to shine without any banding or compression issues. Dolby Atmos is making an increasing appearance on discs these days, and there are a good couple of sequences that pass for demo moments for those with the right kit to pump out the Dolby TrueHD encode through their 7.1 setups. Basic story comparisons to the first Toy Story will abound for those that easily spot them, but that was over fifteen years ago now, and less demanding and younger eyes and ears shouldn’t be too bothered by any similarities. Illumination’s rendering of an ideal, picturesque New York makes for a fairytale-like setting and a highlight of the movie all on its own, while the vocal performances, largely from a lesser-known cast, makes for a change from the usual spot-the-star voice game. Universal’s disc isn’t exactly packed with terrific supplements pertaining to the main feature itself, but the additional short films provide good value and their making of featurette is especially welcome. I wouldn’t say The Secret Life Of Pets was an instant classic, but it’s a cut above the usual sub-Disney/Pixar fare and as derivative as it is, it’s still fun.